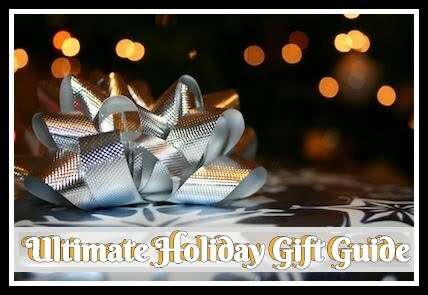 I have always been one of those people who loves to find unique and out of the ordinary clothing and accessories especially those that help better express myself. Way back when I used to live for finding shirts that had creative sayings or quotes on them. I am all about expressing your personality through clothing, hair color, tattoos, and any other way you feel. I have also always been one of those proactive people against 'bullying' of any level. I have always made a point to be nice to everyone (popular or unpopular) throughout my life as well as setting that example for my three children. I love teaching them to embrace people's differences and always being kind to one another. Searching out some inspirational quotes recently, I actually came across a clothing line called The Talking Shirt and was of course hooked as soon as I realized all the great shirts they had. "The Talking Shirt is a USA based company - family owned and operated...founded in 2013. 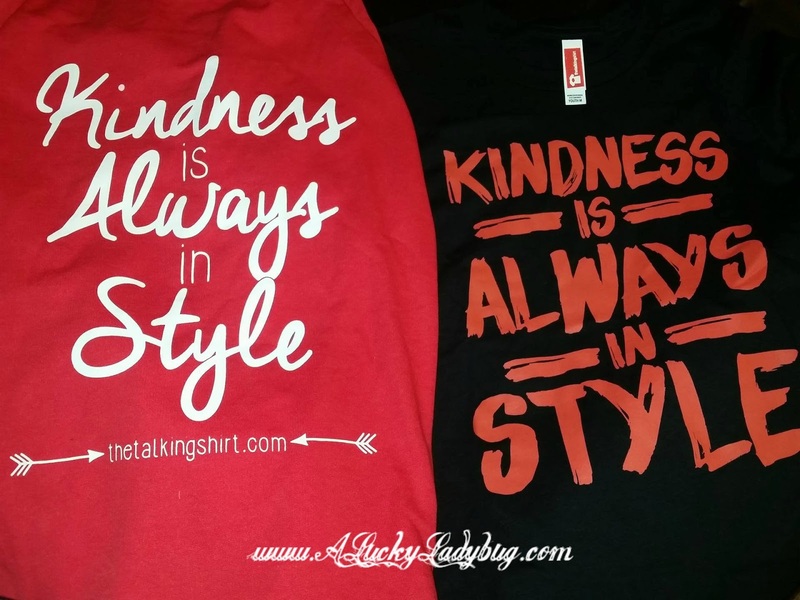 We saw the need for tees with positive, uplifting messages." 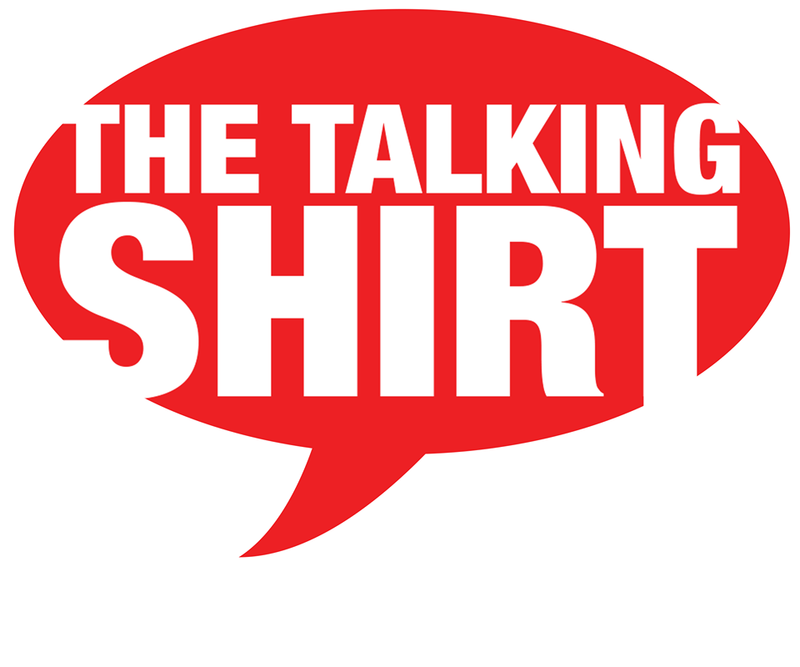 So finding a lack there of, The Talking Shirt was created and has become ever so growing in popularity. I was sent over a matching design to sport around with the boys and I've honestly fallen in love. We picked the "Kindness is Always in Style" Raglan and Tee. When these arrived, we had to wear them the very next day. Besides the saying what I especially like is how extremely soft the tees fabric is! Both boys think its super comfortable to wear to school, bed, or wherever. Believe me - they have. My boys literally have me wash their shirt constantly so they can take turns wearing it at least once a week each of them! My Mother's Day gift even perfectly had a picture of Declan wearing it at school! The Raglan sweatshirt has been extremely comfortable to wear being soft inside and out. Even being pregnant and getting constantly bigger, I've been able to wear without feeling uncomfortable in the slightest. 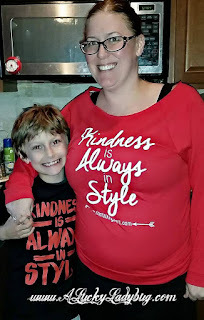 Being a matching shirt, I love being able to plan to match them whenever we can and more importantly, the shirt has provided us with a great "talking point" together and with others. Seriously about the only complaint I can come up with is the fact that a lot of the designs are "fitted tees" and designed for little girls. Having two boys, this limits how many of the tees I can get for the boys to sport around. Otherwise, I'd have everyone already! This is one of those products and brands I will be forever loyal to now discovering what an inspirational company is actually available for myself and my kiddos! Recommendation: I love with the material and the design of these shirts. The price is beyond reasonable especially for the quality printing and material! 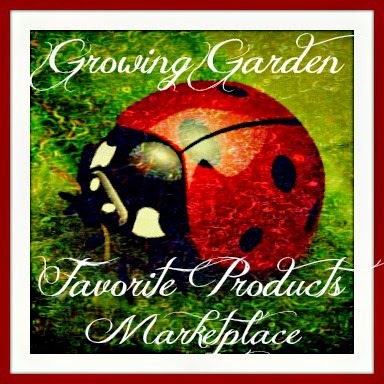 This is definitely a feel good company that I would recommend checking out and buying! I'll be buying more for sure (probably as soon as this review is posted)! 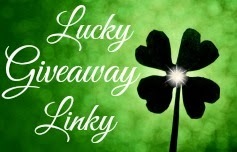 Giveaway: The Talking Shirt is going to give one of A Lucky Ladybug's lucky readers a shirt of their choice to have of their own! Aww look at your baby bump! I love the She Believed she Could so she did shirt. I would choose a Mama Bear shirt. Since my name is Barrie (yes, I'm a female named after a female! ), my nickname is Bear! 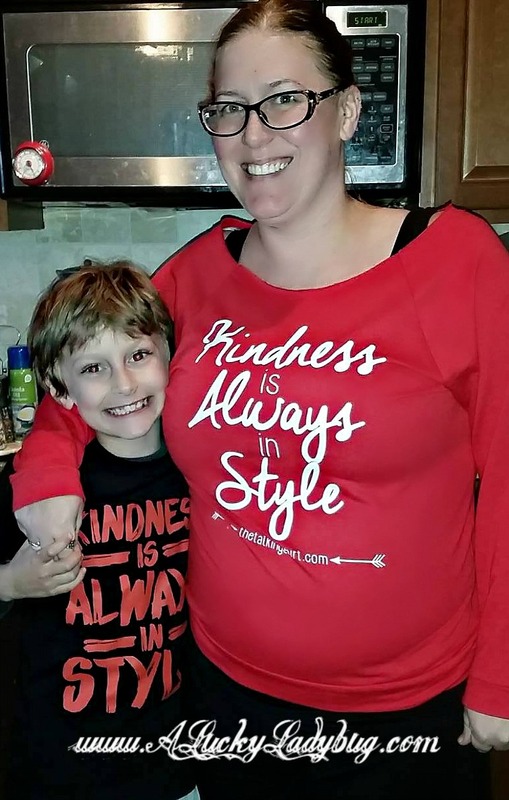 Perfect Tshirt for this mama! Quite honestly I think you and I are on the same page. The one that you're wearing would be my choice as well. I like the Have Your People Call My People Tshirt-very cute! If I was the lucky winner, I would choose the "I LOVE YOU MORE" FITTED TEE! I like the Kind Heart shirt. I would love to get one of these Talking Shirts for my daughter. 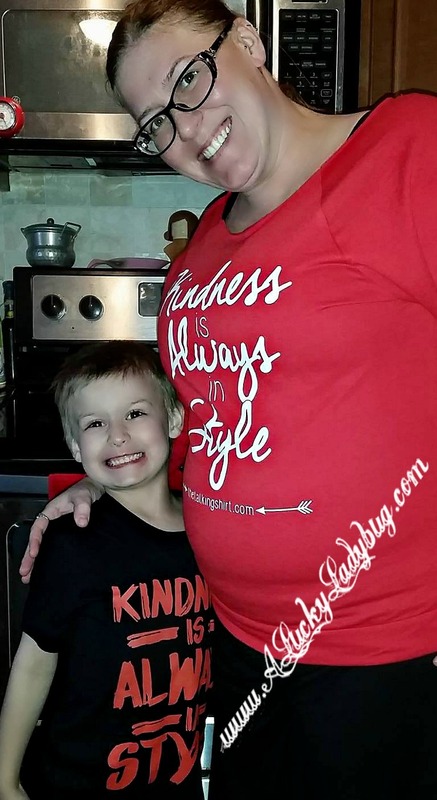 I really like the "KIND HEART" FITTED TEE for her. I like the Set Free Shirt. I'd choose the Be Strong and Courageous tee. I like t he My Life Story body suit! Everything here is so precious and trendy! I like the "She Believed She Could So She Did" Fitted Tee shirt. I like the mama bear raglan tee for women. Super cute. I would choose the coolest brother ever tee if I won. I want the girls sister shirt. I like the SHE BELIEVED SHE COULD SO SHE DID shirt. i want the i love you more fitted shirt. super cute. I like the Women's Be Ye Kind tee. The "Mama Bear" fitted tee is cute, too. I like the "KIND HEART" FITTED RAGLAN the most. There are definitely several possibilities, but I would probably go for the 'Have Your People Call My People' tee. I love the Faith Not Fear shirt!